HomeRoutines, a $5 app from Wunderbear, tries to help you ensure you get your household chores done by letting you award yourself gold stars for doing them. The app attempts to break down all the things you need to do in your home into smaller, more manageable parts, and in several different ways. First, HomeRoutines divides up your home maintenance to-dos into Morning and Evening tasks. The app comes loaded with a bunch of built-in tasks, like "Feed cat" and "Put away clean laundry" to help you get started. You'll obviously have to customize those lists to match your own needs; I tapped in things like "Clean up kitchen after kids eat breakfast" and "Take out recycling." As you take care of each chore, you tap the star icon next to it to mark it as complete. If you complete all of your Morning tasks, the Morning entry on the app's home screen gets a gold star of its own. Day By Day: HomeRoutines divvies up home maintenance to-dos between Morning and Evening tasks. Complete all of the tasks associated with a time of the day, and you get a gold star. Adding and editing recurring daily tasks is simple, and you can also create daily to-do entries for one-off tasks. Beyond all its daily task functionality, HomeRoutines also offers different home "zones" to focus on each week. By default, the app rotates through five zones; one week you're instructed to focus on bathrooms and the laundry room, for example, tackling needs like decluttering, disinfecting, deodorizing, and dusting. Overall, HomeRoutines is a cute attempt to make daily household chores more palatable, but probably not enough to transform you from Bluto to, say, Martha Stewart. Sure I’m Sure: Despite an impressive breadth of data, HomeKeeper has a frustrating workflow—like when it asks you to confirm the task you’ve just painstakingly entered. HomeKeeper, a $4 app with a free lite version from 42 North, also aims to help you take care of your home. The app comes packed with more than 100 household maintenance tasks—including photographs, recommendations on how often you should do them, and general instructions. The app includes those tasks that you know should do but frequently neglect, like cleaning the gutters, or changing the batteries in your carbon monoxide detectors. It also includes tasks you may not even realize you're neglecting, like checking your garage door's safety shut-off each year. While I love the breadth of data included in the app, I'm pretty disappointed by HomeKeeper's presentation. Leaving aside its look, which feels a bit clunky and out of place on the iPhone, the app's actual workflow is rather frustrating. Example: I wanted to add that carbon monoxide detector battery check as one of my tasks. I tapped to turn on "recurrence" (which oddly defaults to off), and then went to change the frequency from the default of every six months. But when I tapped on the frequency field, the editing screen that appeared confusingly didn't respect the previous selection; instead, it jumped up to the highest frequency ("Every Week"), which was a small annoyance. Far more frustrating, though, is that once you select recurrence, you're also forced to choose an "end date." HomeKeeper's central conceit is that these are tasks homeowners must take care of consistently—I don't want an end date other than perhaps "my own death." Since that's not an option, I just spin the year chooser violently for some arbitrary end date in the 2030s. 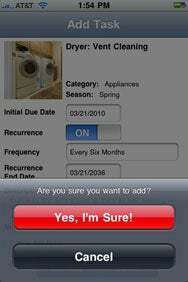 Once all the fields are filled out and you tape to save the new task, the app requires you to confirm that you really want to add it—by tapping a bright red button normally associated with confirming deletions on the iPhone. I'm not sure I follow the logic of confirming adding data, since it's easy enough to delete or edit any mistakes. Add to all these frustration points the fact that the interface generally responds a bit more slowly than I'd like, and you end up with a decidedly unpleasant experience. Even if you can look past HomeKeeper's numerous annoyances—and if you can, I envy you—one more glaring weakness renders it useless to me: Without push notifications or calendar integration of some sort, you must remember to launch the app each day to know if you have any current tasks to handle. If HomeKeeper wants me to keep on top of my home's maintenance, then the app needs to keep on top of me. Both HomeRoutines and HomeKeeper share admirable goals of helping you take care of your home. Neither, unfortunately, is particularly well-equipped to make sure you do so. HomeRoutines sports a much iPhone-friendlier interface and is a lot easier to use—but of course it lacks the library of maintenance tasks that are built into HomeKeeper.